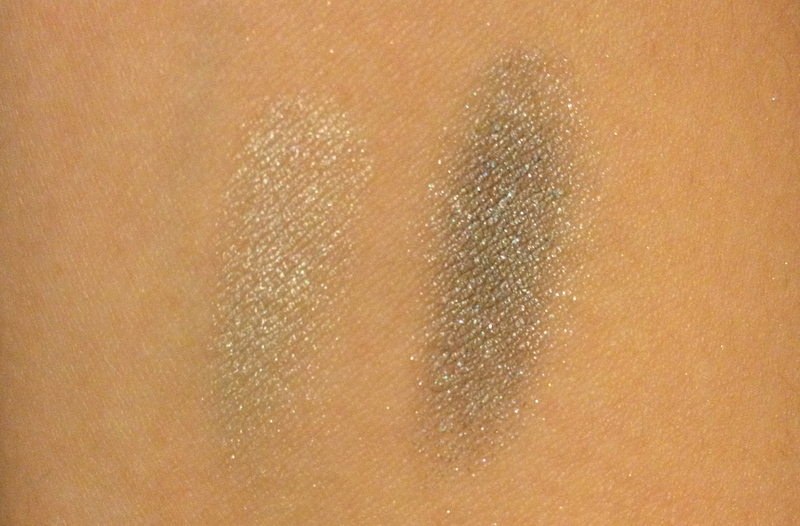 I’m so sorry I’m late on this review—I haven’t had much time to photograph swatches lately, and I wanted some time to play with the colors to decide which combinations to show you! So, I have finally been united with the rest of my new Color Tattoos–Seashore Frosts (40), Waves of White (20), Shady Shores (25), and Icy Mint (30)! If you’re wondering, this means I don’t own Precious Pearl (10), Cool Crush (35), and Lavish Lavender (45). Like I mentioned in my post about Blue Paradise (15), I really just wanted to get Seashore Frosts after looking at a bunch of swatches online. But now that I have all of these, I’m glad I tried more of them! 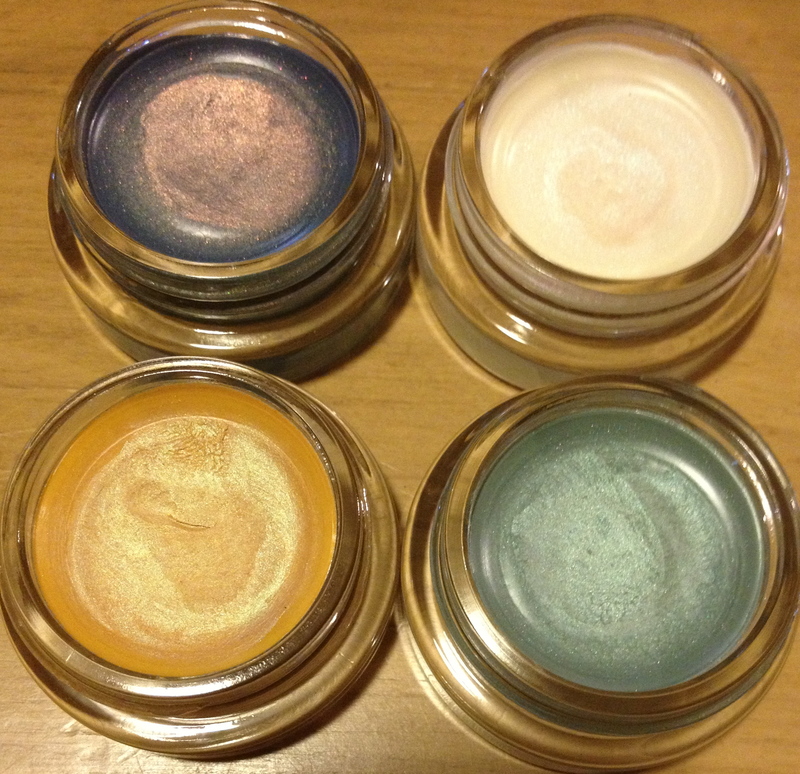 I still feel like the texture of these is much creamier and wet than the colors I own from the original line, and I think as a result I don’t need to use as much on my eyes. Also, they don’t seem to crease as easily, so that’s a plus as well! 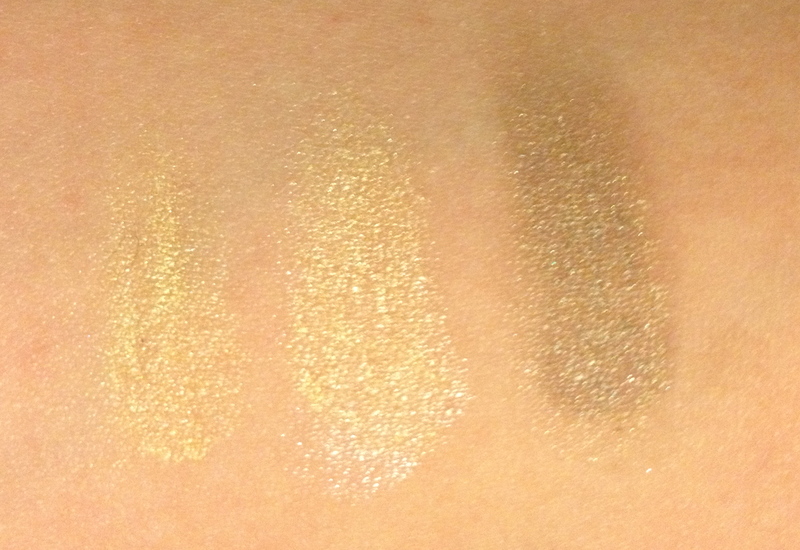 You’ll notice below that I use various colors to swatch these on top of. 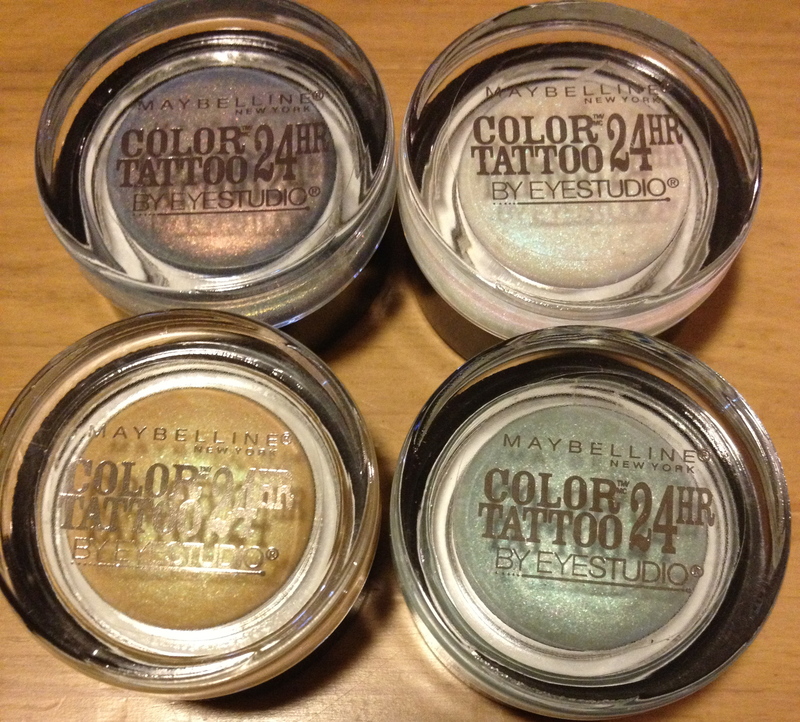 Some are from the original Maybelline Color Tattoos line: Too Cool (05), Electric Blue (75), and Tough as Taupe (35). I also used a blush from TheBalm as the matte pink (Down Boy) and a matte black Sephora eyeshadow. I love the look of it over Electric Blue and Tough as Taupe. Putting it over blue keeps the blue-toned base for contrast with the shimmer, but with taupe underneath you can really see the bronze and red tones of it. Both are gorgeous and completely different looks! You can put white underneath to really make the white base pop, but when it’s over the other colors you get more of the teal/pink/purple shimmer. My favorite is over pink, because it brings out the pink and purples of the shimmer the most (like I said, princess-y). It looks very mermaid-esque over blue, so there are lots of great options for summertime beach looks, but the teal seems to shine the most over black. Like Seashore Frosts, you can get very distinct looks with this color, but I think you can get even more with this one. I think it’s pretty ironic that the one shade I thought I’d get the least out of seems to have the most possibilities! Shady Shores is a sandy yellow with lime green shimmer. I’m still figuring out which colors would look best underneath it to make it pop (possibly a green or yellow), since it does go one quite sheer. But, I think its a more beautiful color than the description makes it sound! When it’s put over white or yellow, the yellow base really stands out, but over anything else the green shimmer is most prominent. I tried putting this over a beige base, but it seemed to fade by the end of the day. That could have been due to a faulty base color or to the product itself, so I think I have to keep playing around with this one. But for now, I think it’s really beautiful if you have the right base colors to make it stand out. Icy Mint is the only non-duochrome shade I have from the line. It’s a pretty mint green with silver shimmer. I think this color looks nice on its own, but the silver is so strong that I recommend putting a green shadow underneath so you don’t lose the beautiful mint color. So, like everyone else in the beauty world is saying, these are worth the money if you’re looking for some really interesting and versatile shades. I would totally go for Seashore Frosts and Waves of White first, since they seem to get you the most looks for your money! Seashore Frosts is the most neutral duochrome if you’re looking for something classic, while Waves of White will give you more fun and dramatic looks. But honestly, whether you get one of these or all of them, you really can’t go wrong! It might be worth a try! It seems like one of these might get more use than one from the regular line because they are more versatile, and the formula is more user-friendly, in my opinion. I may get the lavender one, they are so pretty! Yes, I’ve heard that one comes off more of a really pretty plum. It’s not a duo chrome though, and I was definitely more attracted to the ones with a shift. I really like the way the colors change when you layer them. They’re like finger paints!